On January 1, 1862, William H Horsfall enlisted in Company G, First Regiment Kentucky Volunteers as a Drummer Boy at Camp Cox, Virginia (now Charleston West Virginia). At enlistment time he was described as being 4' 3" tall, light hair, light complexion, and blue eyes. On May 21, 1862 at Corinth, Mississippi, he saved the life of a wounded officer and won the Congressional Medal of Honor. The following is in his own words. "I left home without money or a warning to my parents and in company with three other boys, stealthily boarded the steamer Annie Laurie moored at the Cincinnati Wharf at Newport and billed for the Kanawha River that evening about the 20th of December 1861. When the bell rang for the departure of the boat, my boy companions having a change of heart, ran ashore before the plank was hauled aboard, and wanted me to do the same. I kept hiding until the boat was well under way and then made bold enough to venture on deck. I was accosted by the captain of the boat as to my destination, etc. and telling the old orphan-boy story, I was treated very kindly, given something to eat and allowed very liberal privileges. I arrived at Camp Cox without further incident and enlisted as a drummer boy. In the fighting before Corinth, Miss. May 21, 1862, Nelson's Brigade was engaged and my position was to the right of the First Kentucky, as an independent sharpshooter. The regiment had just made a desperate charge across the ravine. Captain Williamson was wounded in the charge and in subsequent reversing of positions, was left between the lines. During the Siege of Corinth a Union force 30,000 strong, under General Pope, occupied Hamburg Landing five miles above Pittsburg, where General Halleck was in full command. The movement against Corinth was made on the 30th of April. There was little or no engagement. Beauregard evacuated the town on the 26th of May and the Union Army took possession on the 30th. Drummer Horsfall was on all the subsequent marches of his regiment. During the famous charge at Stone River, he presently found himself hemmed in by rebel horsemen and hostile infantry. Even the rebels took pity on his youth and one of them shouted: "Don't shout the damned little Yank! I want him for a cage." The plucky little drummer made a run for his life and safely got back to his regiment. During November and December of 1862 he was sick and was sent to a hospital at Nashville, Tennessee. H later returned to service and was discharged at Louisville on August 19, 1864. On March 20, 1865, he was mustered into Company K, 4th Regiment of the US Veteran Volunteers at Todd Barracks in Cincinnati. At that time he was described as being 5'2" tall. He served at Camp Stoneman, Maryland. 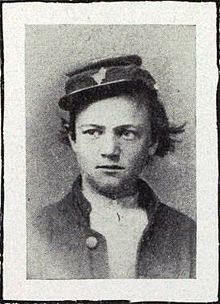 For this enlistment he was paid a bounty of $400 and was discharged March 1, 1866. He returned home to Newport. On October 11, 1893 William Horsfall applied for an increase of his pension due to rheumatism and a resulting disease of the heart. (Pension #423,913). He was 46 years old and needed the personal aid and attendance of another person. At that time he lived at 167 Liberty Street in Newport. On April 7, 1915 he gave further information that he lived at 517 W Ninth St. in Newport. In 1916 his Medal of Honor Certificate states that he lived at 522 Lindsey St. in Newport. He died 22 October 1922 and was buried at Evergreen Cemetery in the Soldier's Section, section 35 lot 175.